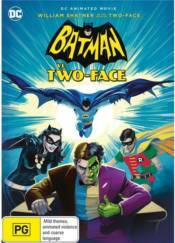 Using King Tut as a pawn, the mysterious crime boss known only as Two Face, stages a daring crime wave that baffles Batman and Robin and threatens all of Gotham City! Will Bruce Wayne suspect that his closest friend could also be Batman's greatest enemy? With Catwoman's help, can The Caped Crusaders discover the secret identity of this devious Jekyll/Hyde hoodlum before he discovers theirs?